For the first time ever, Christian Aid has produced a Virtual Reality experience! That’s right, we are bringing VR to Greenbelt! 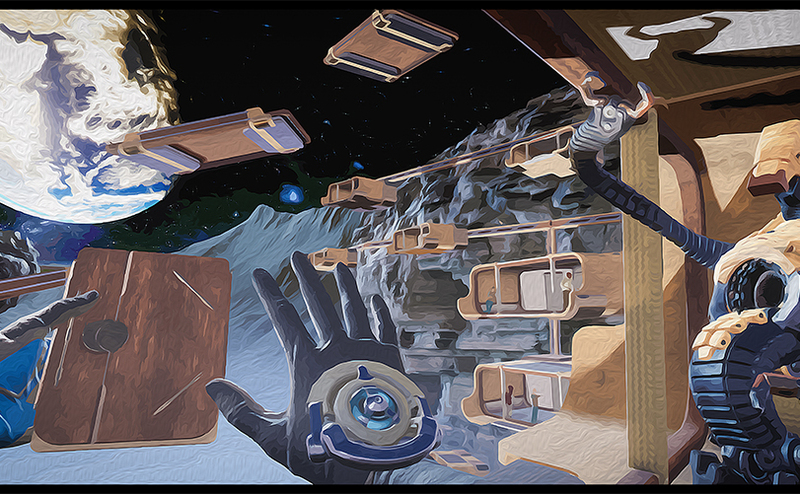 Enter our virtual world and see how you would fare in the world’s first lunar colony: Moonbase Eco. Explore your new home and see if you can survive the challenges that arise. The Virtual Reality experience is available all weekend. Make sure you book early, at the start of each day, to avoid disappointment! Our venue and our VR experience are all about telling stories, in particular, those which you may never have heard, stories from people who have been forced to leave their homes. Come to the venue to see our Uprooted exhibition which tells these stories through beautiful photographs and personal testimonies. We will share our campaign with you and ask you to take action to ensure that these important stories are heard by our Prime Minister. Our storytelling extends beyond our venue this year… keep an eye out for our storybook sculptures and our bookworm who will be wandering around the festival ready to share stories with you. This year’s programme is once again full to the brim: come and hear Inderjit Bhogal, the founder of City of Sanctuary, explore the concept of Sanctuary Churches. Paula Gooder, a New Testament theologian, will be sharing insights about why her new book is a novel. Join debates about climate change, capitalism and the place of theology in Christian Aid’s campaigning. Attend one of our workshop’s equipping you to take action. Take part in a prayerful craft or Celtic prayer. Hear from Christian Aid’s new CEO, Amanda Khozi Mukwashi, who started her new role with us in April. In addition to all of this, we are delighted to be hosting Gareth Davies-Jones, a gifted folk singer-songwriter as our artist in residence. Each day Gareth will host songwriting workshops based on stories from our exhibition. After these sessions, Gareth will take your words and ideas and craft a song to be performed in his set each evening at 6pm. With over 30 sessions across the festival weekend we have lots to offer including a ceilidh, daily worship, bedtime stories for grownups, a Big Brekkie a much more! Greenbelt is going to be amazing with so much to see and do! If you find yourself wanting to take a break or you would just like a space to sit and meet others, join us for coffee and a bite to eat as this year sees the return of The Real Junk Food Project as our partners in the café. They will be providing delicious hot meals alongside our Christian Aid café team serving tea, coffee and cakes. We have something for everyone and we cannot wait to share it with you! See you soon!